He was born in the middle of a big city. Fred finds life in the city hard. It's smoky. It's noisy, and it's very, very fast. Fred is a city fox. The city is a scary place for a fox like Fred. It's noisy, it's smoky and it's often dangerous. One day Fred sees a flock of birds flying away over the city roofs. "Where do they go?" he wonders. And so he sets off to find the wild. All the other city animals say that there is no such place, but Fred know better or does he? 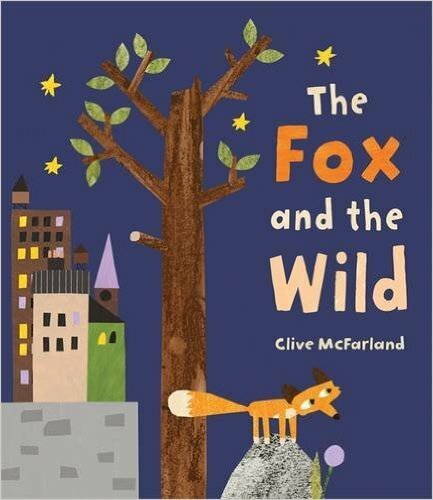 The Fox and the Wild is a new picture book from Clive McFarland, writer and illustrator of A Bed for Bear (HarperCollins). Illustrated in bold, collage-based graphic style, this is an animal adventure with an environmental message. The book is illustrated in a bold, modern style and there are lots of things to talk about in the pictures, including the ways in which Fred looks different from his cousins and his new friend. The language is simple, making it perfect for young children. For those about to embark on a move from town to countryside, this book is an absolute winner as it paints the city as bad and the 'wild' as good. If you're planning a move in the opposite direction though, I'd advise you to give this book a miss! This is so true. I remember one month when I needed to make my entire rent in one week. I was paralyzed with fear but after I realized that wasn’t getting me anywhere, I set to work and didn’t think about anything else. I worked insanely long hours that week, but I got it done 🙂"